As your new, mixed-logic (5V and 3.3V) design evolves and your current requirements change, your new DC/DC converter will not. 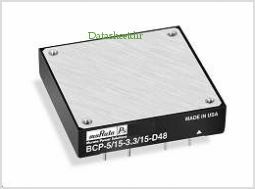 Murata Power Solutions' BCP-5/15-3.3/15-D24 (18-36V input) e and BCP-5/15-3.3/15-D48 (36-75V input) are fully isolated DC/DC converters providing both 5V and 3.3V outputs. Housed in standard "half-brick" packages (2.3" x 2.4" x 0.525"), the BCPs CAN support any combination of 5V and 3.3V loading up to a combined total of 15 Amps. Both outputs are fully isolated (1500Vdc) and independently line (0.2%) and load (0.5% and 0.6%) regulated. By C&D Technologies. This is one package pinout of BCP-5-3.3,If you need more pinouts please download BCP-5-3.3's pdf datasheet. 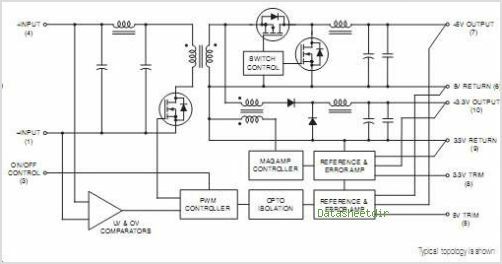 This is one application circuit of BCP-5-3.3,If you need more circuits,please download BCP-5-3.3's pdf datasheet.